Step 1 : Start on one side of your head and begin to french braid as normal. Step 2 : When you begin to gather hair, take only from the top. This means on your second piece, you will NOT take hair from underneath. 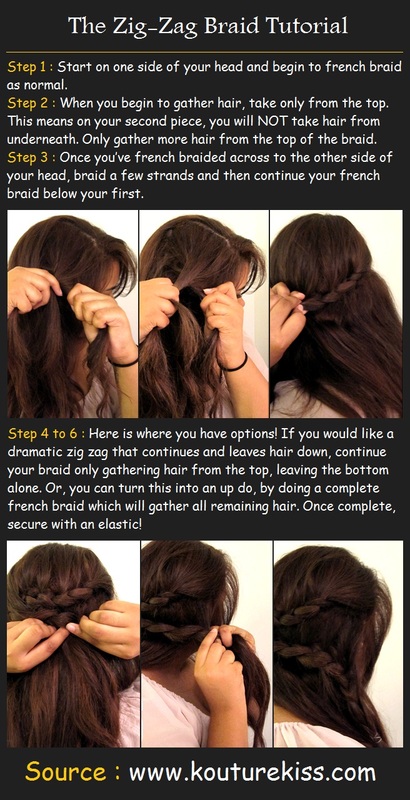 Only gather more hair from the top of the braid. Step 3 : Once you’ve french braided across to the other side of your head, braid a few strands and then continue your french braid below your first. Step 4 to 6 : Here is where you have options! If you would like a dramatic zig zag that continues and leaves hair down, continue your braid only gathering hair from the top, leaving the bottom alone. Or, you can turn this into an up do, by doing a complete french braid which will gather all remaining hair. Once complete, secure with an elastic!